NETWORK UPDATE: ABC benefited most from the adjusted ratings for Monday night, with both DANCING WITH THE STARS and the preview of FOREVER gaining 0.2. The 8PM episode of THE BIG BANG THEORY found an extra 0.1 (unlike last year, when BIG BANG’s season premiere jumped up in final numbers), but SCORPION lost 0.1, as did AMERICA’S NEXT TOP MODEL. ESPN’s MONDAY NIGHT FOOTBALL owned Monday cable, although the Jets/Bears contest was 0.62 below last week’s game at 5.16. LOVE & HIP-HOP HOLLYWOOD (VH1) fell by almost three-tenths from last week to 1.25, allowing USA’s WWE coverage to take the #2 slot, with 1.28-1.36 over its 3 hours, roughly the same as last week. Over the past two weeks, LOVE & HIP-HOP has lost one-third of the ratings the show’s Atlanta version was getting. 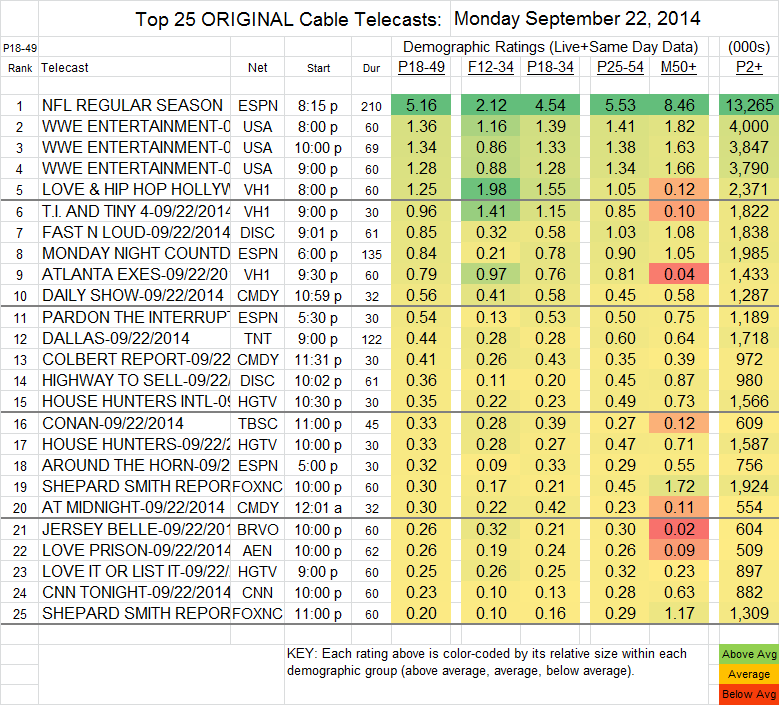 LOVE’s companion show TI & TINY also fell, by 0.14 to 0.96, although ATLANTA EXES was steady at 0.79. FAST N LOUD (Discovery) lost 0.06 to 0.85. The season finale of DALLAS (TNT) rose a single tick to 0.44. Without a REAL HOUSEWIVES installment on the night, Bravo’s highest rated Monday show was JERSEY BELLE at 0.26, down 0.03 from last week. "I think change from Saturday morning to Monday afternoon was a mistake for Total Drama ..."